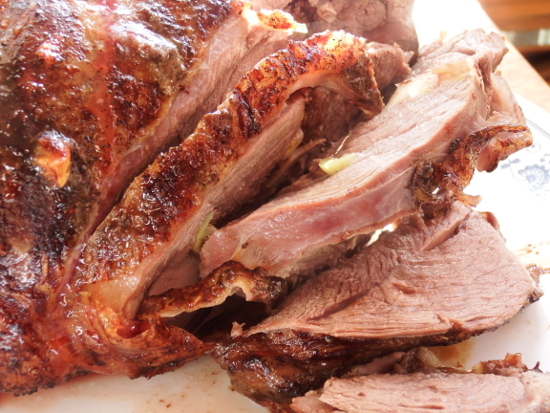 Embedding garlic and thyme directly in the flesh of a leg of lamb imbues the meat with rich flavors. This recipe is perfect for a special occasion when you need to feed the masses, or simply as a way to prepare a week of meat for a family of two. We've even repeated this recipe using a venison haunch, which was nearly as delectable as the lamb, although the venison needed to cook a bit longer. As a side note, I should mention that the juices that result from this dish are almost too good to waste. In the winter, I usually roast root vegetables at the base of the meat to soak up the fats, but for a summer dish, the juices might be better saved to make a gravy. Whatever you do, don't throw them away! Start by bringing the leg of lamb to room temperature three hours before you want to begin cooking. As the lamb warms up, make about 15 slices evenly spaced around all sides of the hunk of meat, then push a sliver of garlic and a sprig of thyme into each gap. Drizzle olive oil over the lamb and liberally sprinkle on salt and pepper. After the leg of lamb is warm, preheat the oven to 425 degrees Fahrenheit and place the prepared lamb in a roasting pan. Bake for half an hour, basting with the accumulated juices after fifteen minutes, then turn down the heat to 325. Continue basting every fifteen minutes, baking until the internal temperature of the meat has attained 140 degrees Fahrenheit. Total cook time for a 4-pound leg of lamb (including the initial half hour at a higher temperature) should be about 1 hour and 50 minutes. When the lamb is done, remove the pan from the heat and allow the meat to sit for ten to fifteen minutes before carving. Serves 12. You sure eat good :). Definitely don't throw the juices out. At the very least, save them in the freezer as a hearty broth, soup stock, or liquid for cooking rice (diluted by half). We do that with any kind of meat we roast, whether in the oven or the crock pot. I also agree with John--you guys sure eat good.